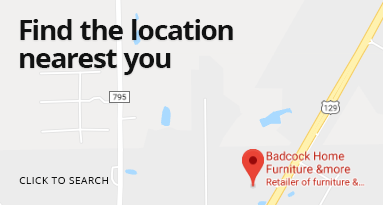 At Badcock Home Furniture &more in Eastman, Georgia, we provide our customers with quality furniture and appliances. We believe everyone deserves to have beautiful furniture and modern appliances. Make sure to ask about our in-house financing and easy payment plans to fit your budget. Visit us at 6377 Oak Street Eastman, Georgia 31023, next to Zaxby’s. We are open Monday through Friday 9:00 a.m.-7:00 p.m., Saturday 9:00 a.m.-5:00 p.m. and Sunday 12:00-5:00 p.m. If you have any questions or would like more information, you can call us during store hours at (478) 374-3425. We look forward to seeing you soon!